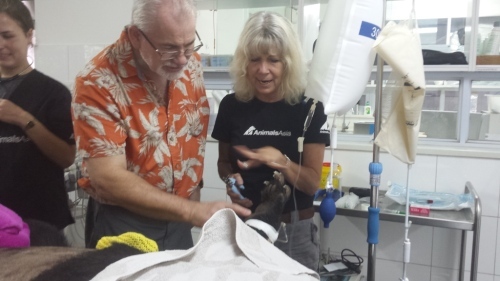 My friends Jo and Paul and Tammy and I were invited by Jill Robinson to attend/witness a medical health check on one of the moon bears at the sanctuary. 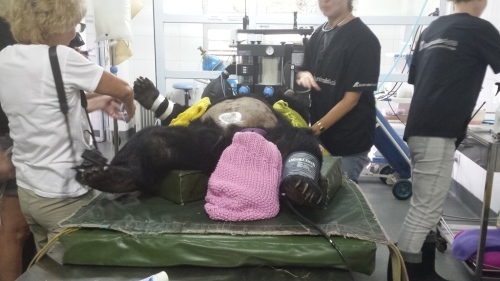 Here name is Blue Bell and she was captured from the wild by a bear bile farmer using a wire snare which cut off one of her paws. 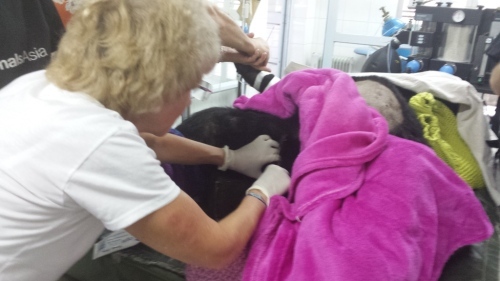 She was rescued from a farm that was shut down and brought to Animals Asia Bear Rescue Center in Chengdu. 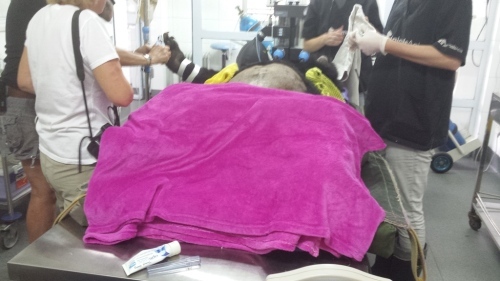 Today she is having her regular health check to ensure her continued recovery from the effects of bile extractions and to treat any medical issues that have surfaced such as teeth needing extraction or claws needing to be trimmed or signs of infection or organ deterioration. It is quite an extensive operation from start to finish. These bears have never been tamed or domesticated so every precaution is taken for the safety of not only the bears but the keepers and the vets. 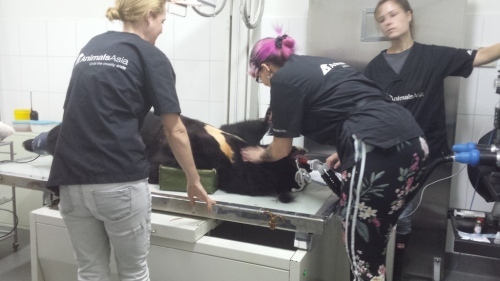 Jill Robinson's priority ONE mandate at this sanctuary is that the bears will NEVER AGAIN experience fear or pain and the procedures they undertake with these health checks reflects how important this mandate is. 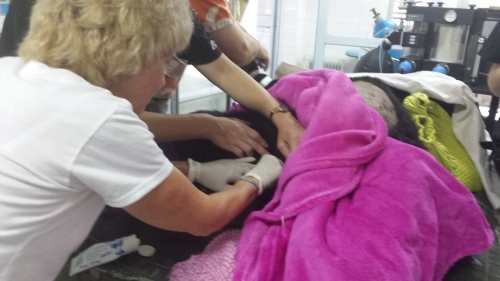 First the bear is completely sedated in the kindest possible way, sedatives being administered in the bear's favorite treat so they have no idea what is about to happen. It takes a long time for the bear to be completely under, and while the keepers and vets wait, there is complete silence and very soft music playing in the enclosure. 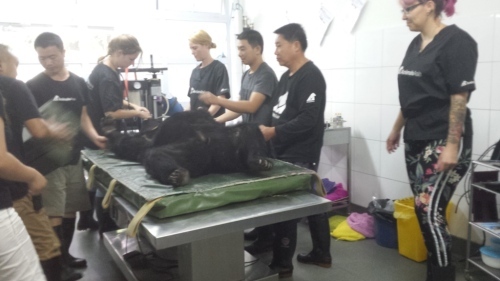 Once the bear is completely sedated, she is put in a transport cage and the cage is rolled into the surgery where the keepers very gently lift her onto the examination table. 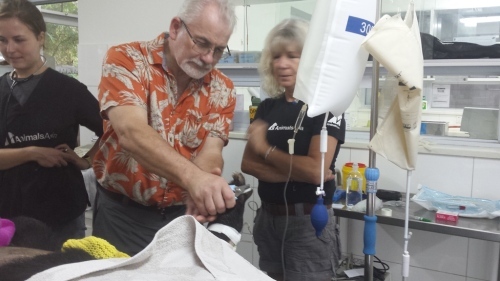 Until the anaesthetist has secured the bear with meds that will ensure she wont wake up, the keepers are on hand to control any potential situation. 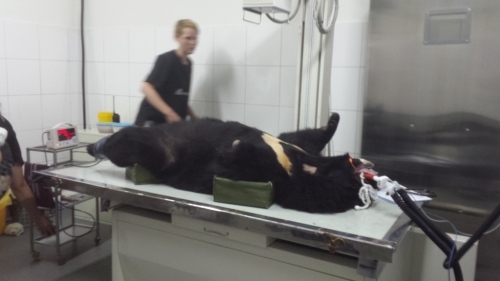 Once the bear is completely anaesthetized, the keepers leave the theater and the examination can begin. 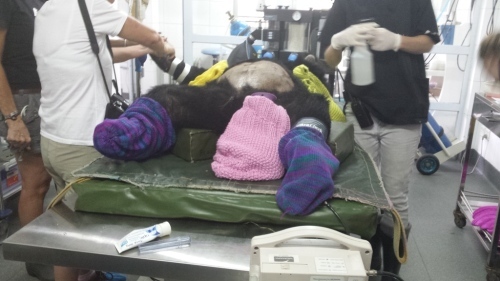 Bears cannot control their body temperature while under anaesthetic so the first thing that needs to be done is to make sure the bear stays at a comfortable temperature so a hot water bottle, socks and a blanket is placed to keep her warm. 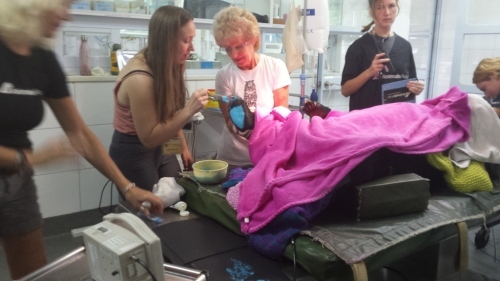 we were all invited to come in close to the bear to see what was happening and also to participate in some of the procedures which was really cool!! In the photos above, Jo is actually trimming Blue Bell's claws with heavy duty nail cutters like I've never seen before. 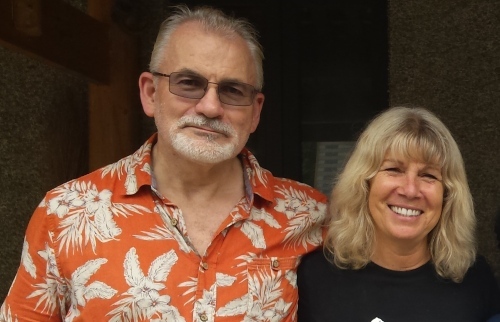 Her husband Paul did the claws on the other paw with close supervision from Jill Robinson herself. In these photos, Jo was shown how to take swabs from Blue Bell to check for parasites or infections in her nether regions. Not the most pleasant job but someone had to do it!! I was busy taking photos and videos!! here they are painting Blue Bell's paw pad which is stamped on a white sheet of paper to check against previous stamps for swelling or size difference, thickness and any scarring of the paws. I got to do this too, when I put my camera down. Here she tells of Blue Bell's blindness and how her eyes had to be removed surgically due to severe glaucoma. here she explains the ultra sound procedure and what it is for. It was an amazing experience, almost two hours of a complete medical health check on Blue Bell and happy to say, very positive results. When she woke up, she was treated to every thing that was her favorite, fruits, toys, enrichments and her best friends so she will never regard these procedures as a negative experience. 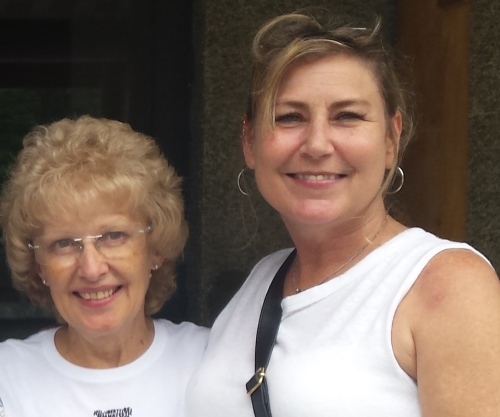 After the health check, I took photos of Jill and my friends. It appears so. But I am glad because those bears have truly suffered more than any human can ever imagine. Oh I am glad too, i just wish some of the doctors that work with humans would show a better bedside manner. I've got a very nice doctor and have had the same one for 30 years so I am glad I never had to deal with ones that have lousy bedside manners. He is due to retire soon so I dont know what I'm gonna do without him. He knows me inside out, back to front, upside down. Even when I was living in Jakarta, I always came back to Perth for any check ups or treatments I needed. I will surely miss him. My odctors have almost always had good bedside manners also...but my mother, at least two of hers were awful. I wouldnt stay with any doctor who didnt have decent bedside manners, I would love for another. Yeah, I didn't get it either...but my mother's first doctor was a real jerk. It’s wonderful and a blessing that there are so many animal loving people on the face of the earth. Anyone who knows me....knows that I love animals much more than I love people!